Driving home from my parent's house last night, it was pretty quiet in the car. It had been a long, fun, successful and memorable day and we were all yawning and exhausted. Despite my anxieties about what to put in their Easter baskets...and how to handle the Easter egg hunt with Brian's nut allergies...everything worked out so perfectly. Thank God for Angry Birds. The morning started out with a gluten free pancake breakfast by your's truly! Then it was time to dive into their baskets. 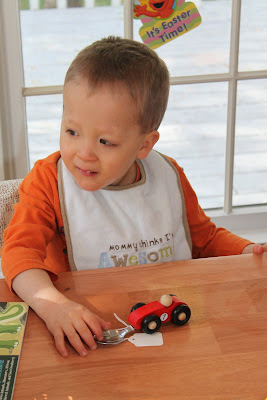 Gavin got a few new movies, a jingle bell instrument that is easy for him to hold and a neat new car spoon (that hopefully will encourage him to try feeding himself! ), lollipops and some tiny cookies. I filled some of Brian's eggs with little cookies, super balls and Angry Bird erasers. He had so much fun opening each one! He also got a fun Thomas the Tank Engine flashlight, a sticker book and lollipops. He was in Heaven. Brian never eats candy (except for the occasional lollipop) so he really didn't know what he was missing. 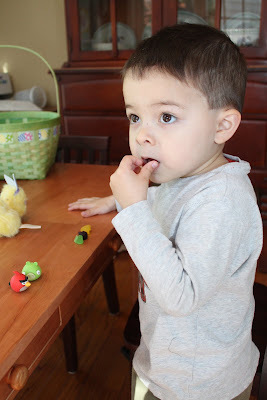 I did find Angry Bird shaped fruit chews that are "Gluten Free, Nut Free and Made with Fruit Juice" and he LOVED them. After lunch, we headed to my parent's house for a fun day with my family. 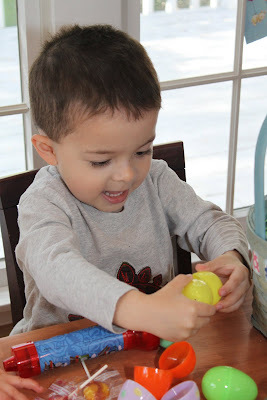 For the Easter Egg Hunt, I filled Gavin and Brian's eggs with their little cookies from home, more angry bird eraser toys, balls and stuffed toys. I wrote a B and a G on their eggs and we hid them in one particular spot in the yard. My brother Mike brought all of my nieces and nephews together and explained the rules of the hunt - and was sure to tell them about Gavin and Brian's eggs, for which I was so grateful. 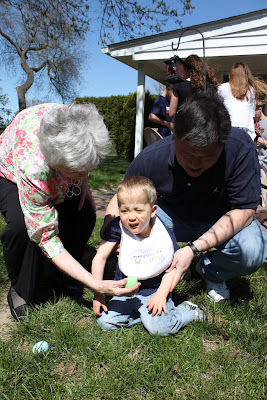 Ed and my Mom helped Gavin pick up a few of his eggs. He was not that into it. It was a bright and windy day (as you can see by his squinting!) so he much preferred to be picked up and shielded from the elements! 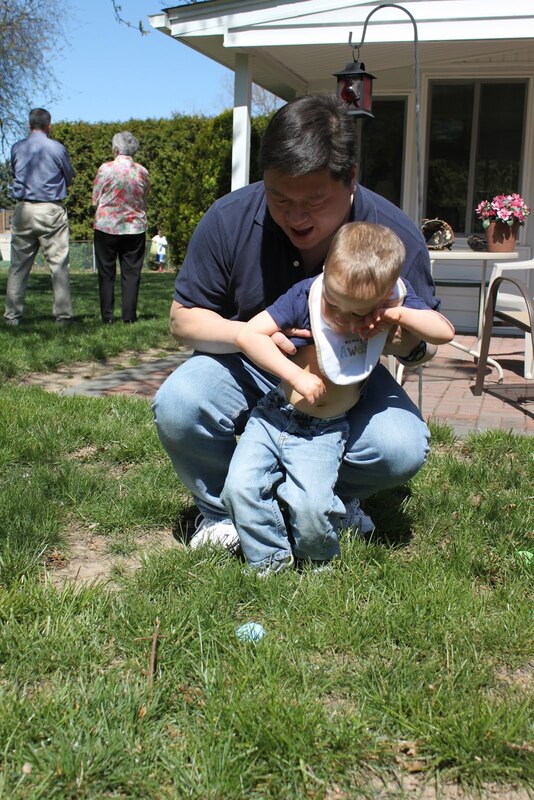 Brian picked up the first egg and didn't care about anything else but what he found in that one! An angry bird, of course. He loves his angry birds!! The whole day was a lot of fun! Gavin was happy and giggling all day. Ed and I were amazed at him several times. Perhaps it was seeing all of his cousins running around...or perhaps my Dad was helping him from above...but he was extremely motivated to try standing on his own. He'd pull up to stand holding my hands - and then I could feel him wanting to let go and stand independently. A few times he did it - for a few seconds!! It was my favorite moment of Easter. 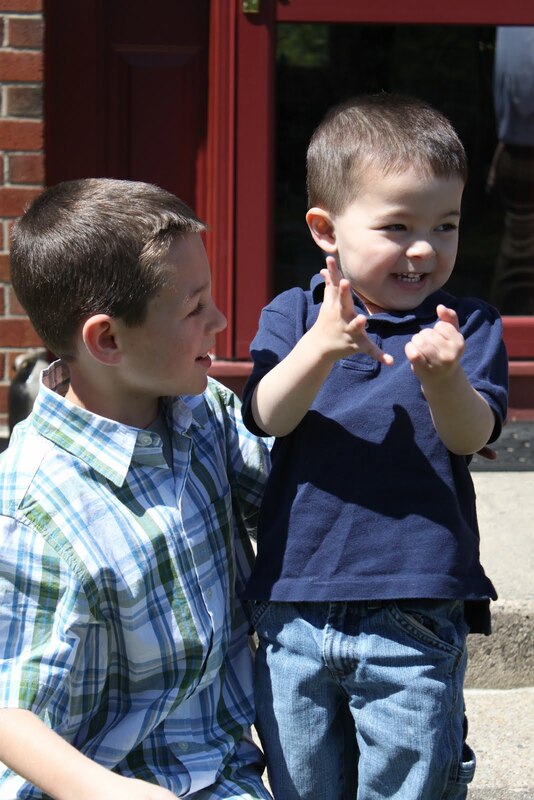 Brian loved running around with his cousins, especially his good buddy Sean!! I took family photos of my brothers and sister's families...but forgot to ask someone to take one of us! And I even bought a new outfit for the occasion (which is a miracle, believe me). And an extra photo of their adorable one year old, Isabella. Is she not a little doll??? 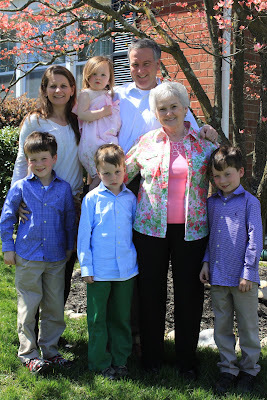 And my sister, Bean, my brother in law, Jim - and their triplets! By the time we got home, we were exhausted. Brian followed me around for a while saying "More candy please!"... "More cake please!"... "More lollipops please!"... "More cookies please!"... all the things he gorged on at Granny's house. 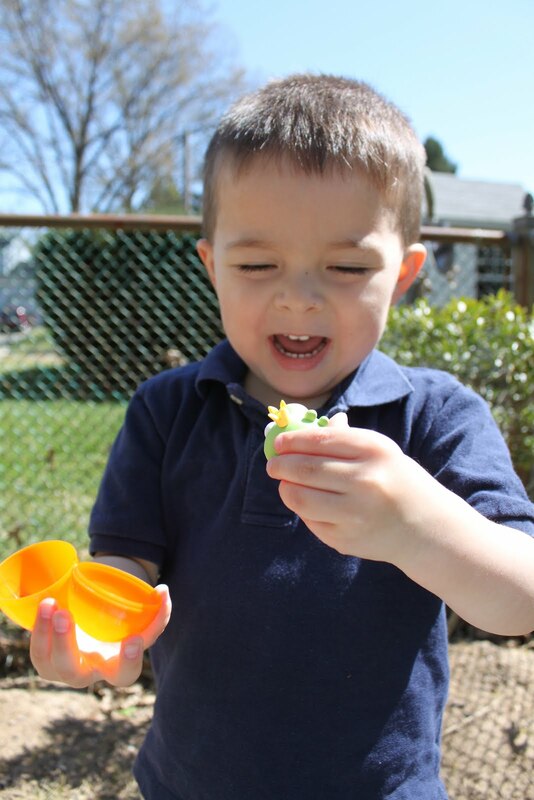 Realizing this was going nowhere, he went to all of his plastic eggs that he had opened that morning. I watched as he re-opened each one and said "nope" over and over as he realized every single one of them were empty. After he opened the last empty egg he walked right up to me and said, "More Granny's house please!" He's one smart cookie. This morning I had an appointment at the fertility clinic for blood work and ultrasound. We were on our way to an embryo transfer as early as April 16th. But one phone call on the way there changed everything. An insurance issue may cause us to either choose a brand new donor or scrap the entire process altogether. It all boils down to billing codes for purchasing a frozen egg versus a fresh donor egg. It's kind of complicated - but the fertility clinic is essentially trying to protect us. Our insurance company tells us we are covered - but there's no real 'billing code' for what we're doing as using frozen eggs from an egg bank is relatively new. They don't want us to be screwed with a bill for ten grand in the end, despite what our insurance company promises us. So we may be choosing a brand new donor...which may delay everything for a month or more. The "I want to do this now and not wait" part of me is frustrated... but this might be a sign that the donor we originally chose was not the right one for us. I was given three choices of donors that are about to go into egg retrieval - perfect timing for us to use any of their eggs. I took a deep breath and, with Ed's encouragement, looked at them with an open mind. We had our minds set on our original donor and this seemed just thrown at us so suddenly at the last minute. But do you know what? I actually like TWO of the three choices even BETTER than our original choice!! but who knows, maybe you will see those 2 lines on your own in the meantime!